This study relates to the determination of radial and tangential stresses and radial displacements in a hollow cylinder made of functional graded material (FGM) subject to internal pressure both analytically and using ANSYS APDL and comparison of the results. The material properties of the FGM cylinder vary depending on a simple power function in the radial direction along the thickness. It is assumed that the Poisson's ratio is constant in the radial direction. Under infinitesimally small deformations, radial and tangential stress and radial displacements on the basis of the differential equation regulating the elastostatic behavior of an FGM cylinder using the plane strain and axial symmetric load assumptions state and field equations were obtained for the analytical solution. The FGM cylinder subjected to internal pressure effect is modeled using dummy thermal loads in ANSYS APDL. The results of radial and tangential stress and radial deformation along the thickness are obtained for four different FGM types and are shown graphically. Analytical and ANSYS results were compared and found to be in one accord. In this study, elastic analysis of the FGM cylinder was aimed to enable the results to be obtained without having to deal with complicated mathematical expressions. Referans1 Timoshenko, SP, Goodier, JN., Theory of Elasticity, 3rd ed, McGraw-Hill, New York, USA, 1970. Referans2 Arslan, E., “Tabakalı ve Fonksiyonel Olarak Kademelendirilmiş Küresel Basınç Kapları Üzerine Analiz”, Pamukkale Üniversitesi Mühendislik Bilimleri Dergisi, vol.23, no.1, pp. 24-35, 2017. Referans3 You, LH., Zhang, JJ. and You, XY., “Elastic Analysis of Internally Pressurized Thick-walled Spherical Pressure Vessels of Functionally Graded Materials”, International Journal of Pressure Vessels and Piping, vol.82, no.5, pp. 347-354, 2005. Referans4 Tütüncü, N. and Temel, B., “A Novel Approach to Stress Analysis of Pressurized FGM Cylinders, Disks and Spheres”, Composite Structu¬res,vol. 91, pp. 385-390, 2009. Referans5 Chen, YZ. and Lin, XY., “Elastic Analysis for Thick Cylinders and Spherical Pressure Vessels Made of Functionally Graded Materials”, Computational Materials Science, vol.44, pp. 581-587,2008. Referans6 Kurşun, A., Kara, E., Çetin, E., Aksoy, Ş. and Kesimli, A., “Mechanical and Thermal Stresses in Functionally Graded Cylinders”, International Journal of Mechanical, Aerospace, Industrial, Mechatronic and Manufacturing Engineering, vol.8, no.2, pp. 303-308, 2014. Referans7 Nejad, MZ., Abedi, M., Lotfian, MH. and Ghannad, M., “An Exact Solution for Stresses and Displacements of Pressurized FGM Thick-Walled Spherical Shells with Exponential-Varying Properties”, Journal of Mechanical Science and Technology, vol.26, no.12, pp. 4081-4087, 2012. Referans8 Rahimi, GH., and Nejad, MZ., “Exact Solutions for Thermal Stresses in a Rotating Thick-Walled Cylinder of Functionally Graded Materials”, Journal of Applied Sciences, vol.8, no.18, pp. 3267-3272, 2008. Referans9 Boğa C., “Analytical and Numerical Axisymmetric Elastic Stress Analyses of Stationary/Rotating Discs Made of Isotropic/Orthotropic Functionally Graded Materials by the Transfer Matrix Method”, Ph. D. Thesis, Adana, Turkey, p177, 2016. Referans10 Nejad, MZ., Abedi, M., Lotfian, MH. and Ghannad, M., “Exact and Numerical Elastic Analysis for the FGM Thick-Walled Cylindrical Pressure Vessels with Exponentially-Varying Properties”, Arch. Metall. Mater., vol.61, no.3, pp. 1649–1654, 2016. Referans11 Hassan A., and Keleş İ., “FGM Modelling using Dummy Thermal Loads, Applied with ANSYS APDL”, Journal of Selcuk International Science and Technology, vol.1, no.1, pp. 10-18, 2017. Referans12 Demirbaş MD., and Apalak MK., “Thermal Stress Analysis wıth Finite Difference Method of Functıonally Graded Circular Plates”, International Journal of Mechanical And Production Engineering, vol.5, no.10, pp. 78-84, 2017. ISNAD BOĞA, Cem . "Elastic Analysis of an Hollow Cylinder Made from Functionally Graded Material Exposed to Internal Pressure". 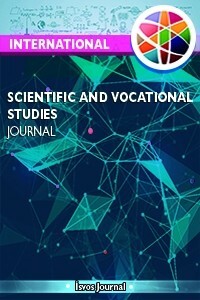 International Scientific and Vocational Studies Journal 2 / 1 (June 2018): 56-66.